Various colours of your choice of yarn, in the weight of your choice (I used Stylecraft Special DK for my finished cushion and assorted aran for the pattern pictures). 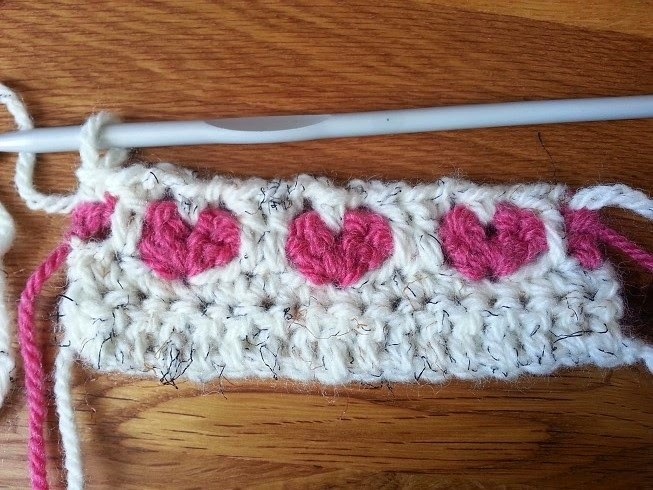 The right size hook for the weight of yarn you are using. 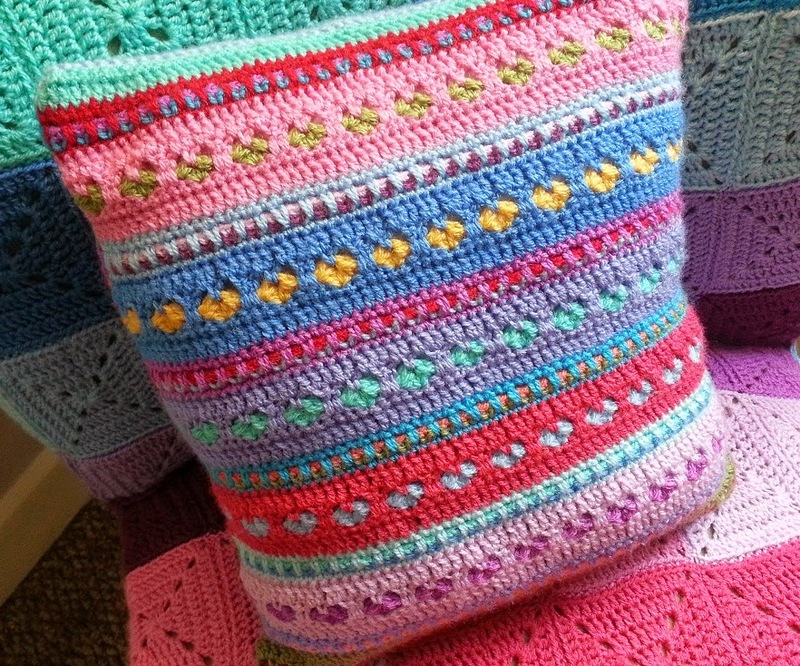 The pattern can be adapted to make cushions or panels for blankets. The exact measurements of your finished panel will depend on your tension and yarn weight. 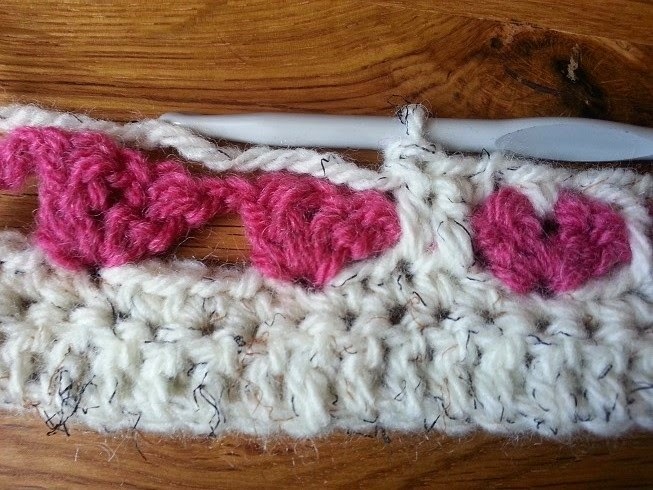 Stitches used are: Chain (Ch), Double Crochet (DC), Treble Crochet (Tr) and Treble Crochet 2 Together (Tr2Tog). 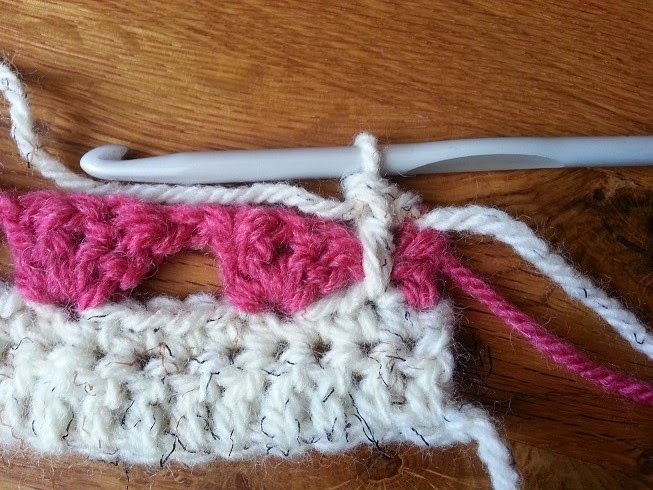 Tr2Tog is made as follows: Yarn over, insert hook in stitch, yarn over, back through to the front of the stitch, yarn over and through the first 2 loops on your hook. Yarn over, back into the same stitch, yarn over, back through to the front of the stitch, yarn over, through 2 loops, yarn over and through all 3 loops on hook. Decide how big you want your panel to be, the foundation chain row must be in multiples of five plus four. The chains at the start of each row count as either 1 DC or 1 Tr depending on the row. It is important that you know which is the right side of the panel you are working on, for ease of reference all rows with just Trebles are the right side. Row 1 - Make your foundation chain (multiples of 5 plus 4). Turn, 1 Tr in 3rd Ch from hook, 1 Tr in each Ch along. 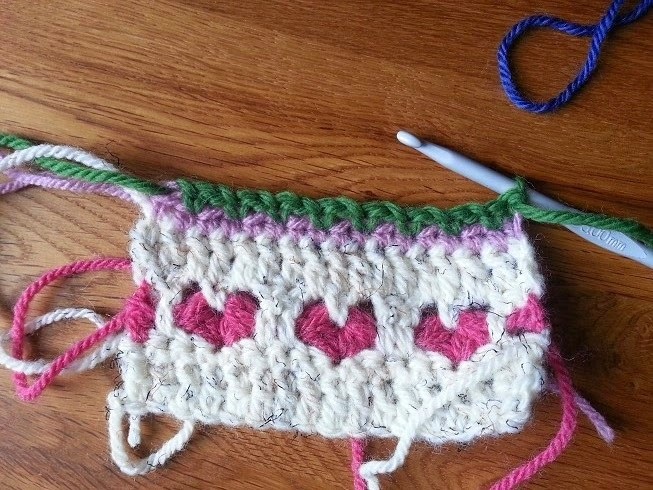 (You should now have Tr in multiples of 5 plus 2 - in my example below this is 17 stitches). Row 2 - Ch 1 (counts as 1 DC) and 1 DC in each stitch across. Fasten off. 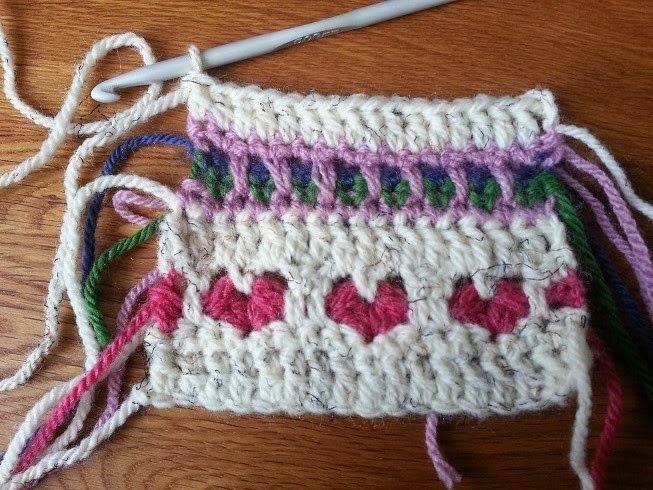 Row 2 (Heart Row) - Join a new colour, Ch4 (counts as 1 Tr and 1 Ch1 space) Skip 2 stitches (*Tr2Tog, Ch1, Tr2Tog, Ch 2* in next stitch, Skip 4 Stitches) Repeat this along the row until you come to the last heart. 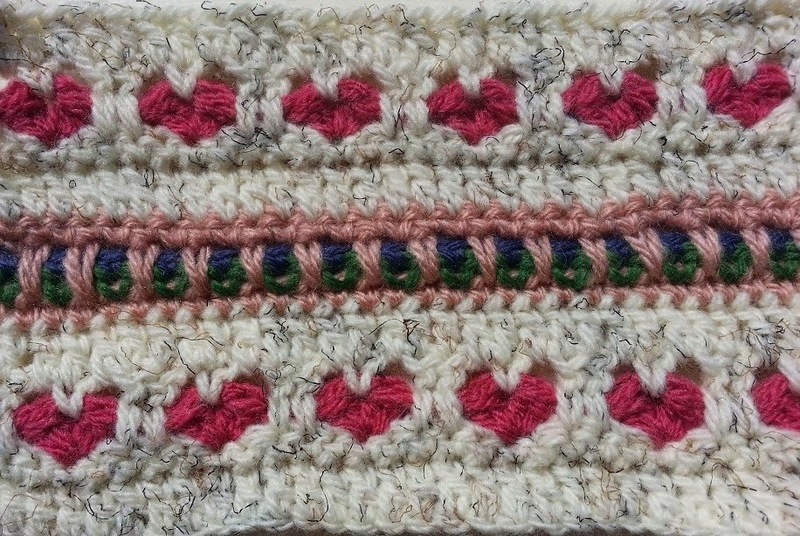 The last heart is made by *Tr2Tog, Ch1, Tr2Tog* Ch1, Tr in last stitch of the row. Fasten off. Ch2, 1 DC in Ch1 space in the middle of the next heart, Ch2, 1 Tr in each of the middle 2 DCs of row 2 (between the hearts). Continue along the row in this way until the last heart. Make your DC in the Ch1 space in the middle of the heart, Ch2, 1 DC in the second spare DC of Row 2, 1 DC in the third Ch of Row 3. Row 4 - Ch3 (counts as 1 Tr), turn, 1 Tr in the next stitch, *1 Tr in the next Ch2 space, 1 Tr in the next stitch, 1 Tr in the next Ch2 space, 1 Tr in each of the next 2 stitches* repeat along. Fasten off. That is the heart part made. 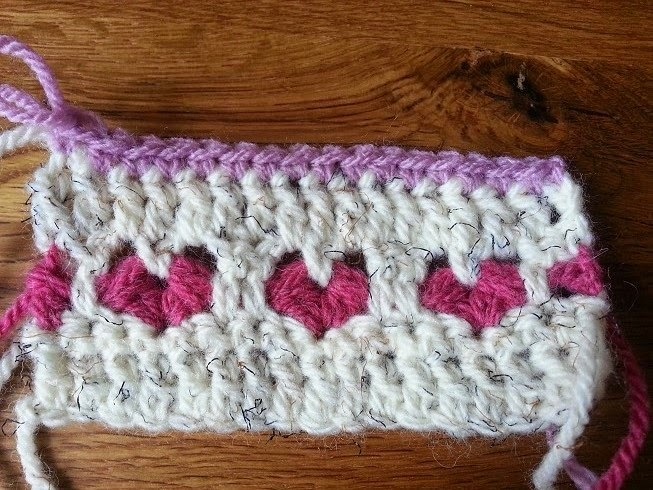 If you want to carry on making just the heart part of this pattern, turn, Ch1 (counts as 1 DC) and crochet one row of DCs (I did this in the contrasting colour) after Row 4. 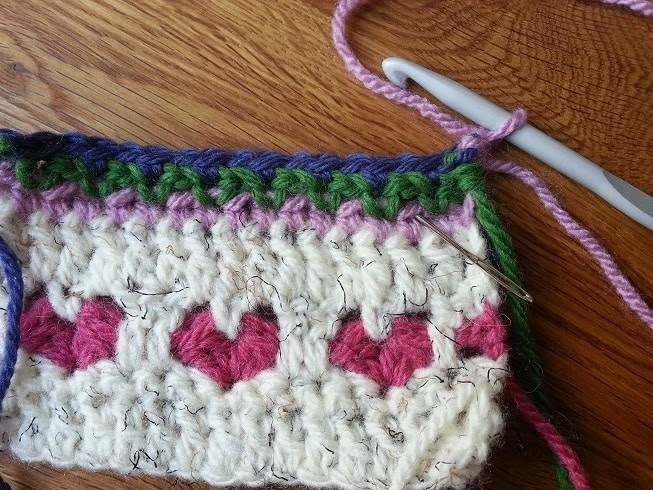 Go back to the beginning of the pattern, chain 3, turn and make your next row of Tr - this will ensure that your Tr rows are always on the Right Side of your work. Now for the Flowers part of the pattern. Row 1 - With the right side of your work facing you, Join a new colour (dusky pink in the picture below) to the right hand side of the last row made. Ch 1 (counts as 1 DC) and 1 DC in each stitch across. Row 2 - Join a new colour. Ch1 (counts as 1 DC), turn, 1 DC in next stitch, *Ch1, skip 1 stitch, DC in next stitch* repeat along the row until the last stitch, 1 DC in last stitch. Row 3 - Join a new colour. (Ch1 (counts as 1 DC), turn, 1 DC in next stitch, *Ch1, skip 1 stitch, DC in next stitch* repeat along the row until the last stitch, 1 DC in last stitch. 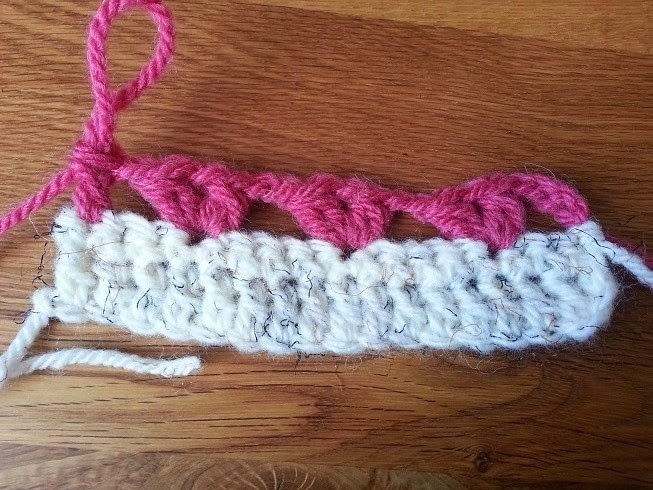 The next row is made by crocheting 1 long DC into the 'spare' DCs of Row 1. *Ch1, 1 long DC into the next 'spare' DC of Row 1* repeat along until the last 2 stitches of the row and Ch1, skip 1 stitch, 1 DC in last stitch. Row 5 - Chain 1 (counts as 1 DC) *1 DC in next stitch, 1 DC in next Ch 1 space* repeat along the row until the last 2 stitches, 1 DC in each of these. 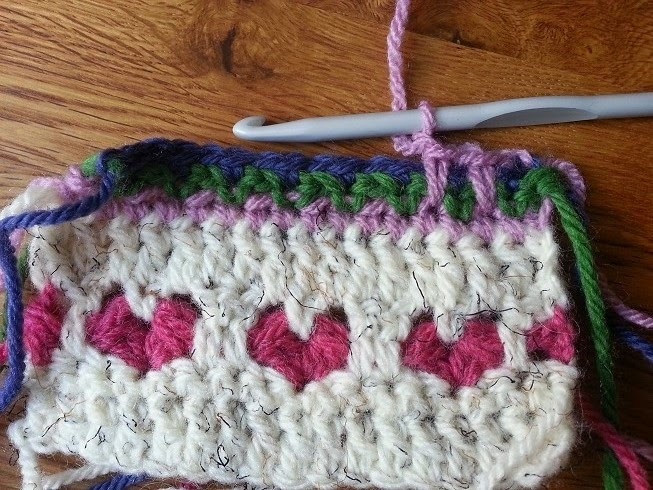 you should finish the row with the same number of stitches that you started with, multiples of 5 plus 2. As you can see the DCs of the flower part of the pattern do tend to tighten the work up a bit, I have found that this goes with a slight steaming when you have finished. 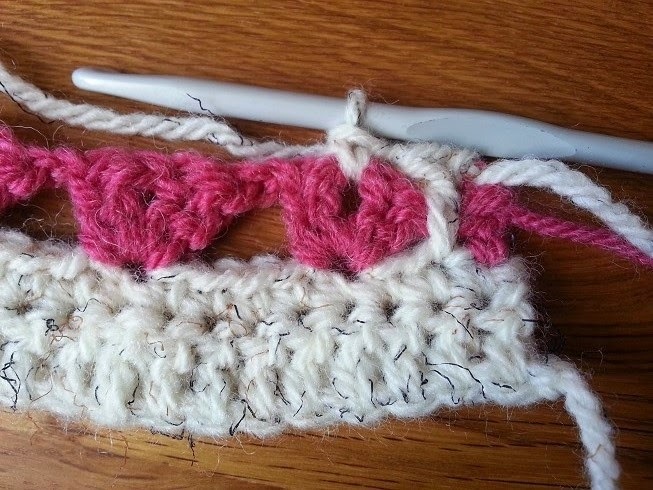 If you are worried that this part is too tight, loosen up your tension a bit for this part of the pattern. If you want to see the original blog post about my cushion is can be found here, along with details of how I made the back. Lovely pattern ... thank you|! 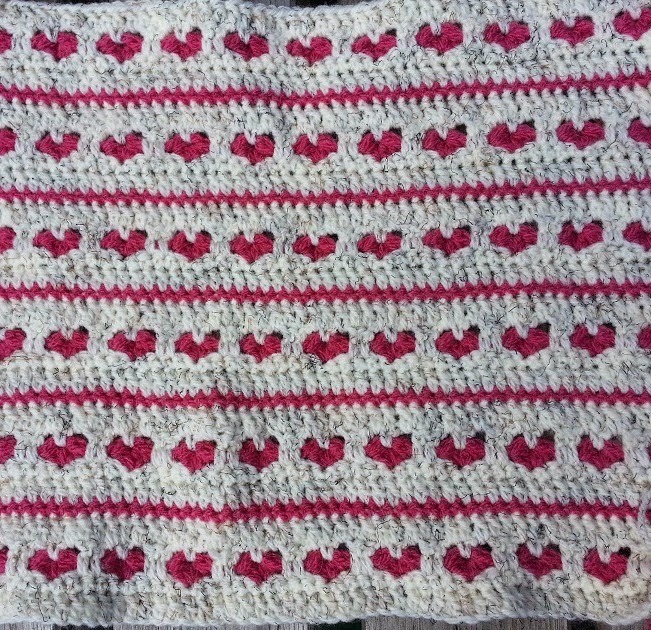 A very beautiful pattern, Thank you so much for sharing. Hello from Greece you have a beautiful pattern. Thank you for sharing. 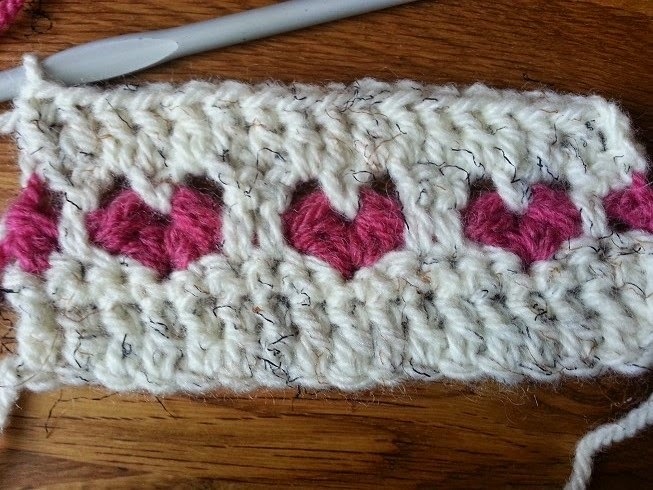 I needed a heart stitch for a scarf. Found yours in an international fb crochet page. You rock girl!